Nigeria’s former Vice President, Dr. Alex Ekwueme, was laid to rest on Friday at his hometown, Oko in Anambra state after a week-long burial rites. Top government officials, close friends and family members gathered to pay their lasts respect to the 85-year-old elder statesmen who died in November 2017. Other are former Vice President Namadi Sambo; the Anambra state Governor, Willie Obiano; Rochas Okorocha of Imo state, Ifeanyi Okowa of Delta state, Okezie Ikpeazu of Abia state, Akinwunmi Ambode of Lagos state, among others. The former Vice President whose remains returned to Nigeria on Monday, died at a hospital in London, United Kingdom on November 19, 2017, following a respiratory illness. In the course of the week, tributes poured in from many prominent Nigerians and top government officials who shared experiences from their relationship with him and described him as a rare gem that will be greatly missed. The Federal Government, in order to immortalise him, has renamed the Federal University in Ebonyi State as Alex Ekwueme University. The university is located in Ndufu Alike Ikwo in Ebonyi. Vice-President Yemi Osinbajo announced the honour today at the funeral rites for the former vice-president at the St. John of the Divine Church, Oko Anambra state. The ceremony was attended by former president Goodluck Jonathan and his wife, Patience. Osinbajo said Ekwueme, who was Nigeria’s vice-president between October 1979 and December 1983, was being immortalised for his selfless service, integrity and contributions to national development. He described Ekwueme as a true Nigerian icon and statesman whose life and times were worthy of celebration. He said he wasn’t only being remembered as an accomplished scholar, or for his architectural prowess or for having occupied high public offices but because he practiced eternal principles that set men and women apart from their peers whether they were poor or rich. Osinbajo said the deceased showed bravery in the face of terror and set an excellent example of loyalty as a vice president. “Ekwueme was a man of principles, of personal sacrifice for others and service to those who cannot offer him reward,” he said. 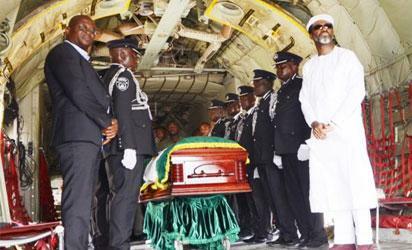 The post Jonathan, Osinbajo, others in Anambra as Ex-VP Ekwueme finally laid to rest appeared first on Vanguard News.